Updated: Oct. 26, 2016 at 10:01 a.m.
For years, students have found themselves embroiled in a battle between the rabbi who had previously led a campus group and the most politically influential rabbi in the region. A long legal battle that has Rabbi Yehuda “Yudi” Steiner and his wife Rivky Steiner banned from running events on campus has lingered since October 2014. Students in Chabad Colonials said the legal aspect of the conflict is no longer a major problem, but they claim that they have become the target of Rabbi Levi Shemtov, D.C.’s top Chabad leader. Those students said Shemtov has sent people to observe the group’s events, has held events identical to theirs and has tried to convince members to leave the group in favor of his own. The issue first began as a legal battle between Shemtov and the student group’s original leader, Steiner. Shemtov fired Yudi and Rivky Steiner from their positions in 2014, but the couple quickly protested the firing. Last year, a judge placed a preliminary injunction of two years on the Steiners to ban them from running any events within a mile of campus. But that legal battle has morphed into a power struggle for the group: Student leaders formed their own organization unaffiliated with either rabbi and say that while the Steiners still attend their events – as they’re permitted under the terms of the injunction – the couple does not have a leadership role. Yudi Steiner declined to comment for this story. The student group is currently registered with the University as L’Chaim Jewish Student Group, but they have operated under the name Chabad GW or Jewish Colonials Chabad in the past. They now colloquially go by Chabad Colonials, which is the name listed on the group’s official Facebook page. 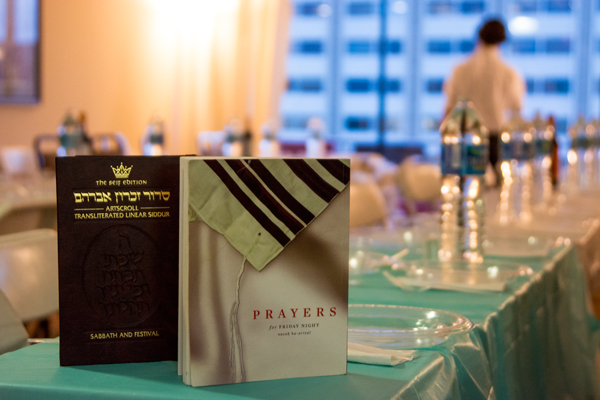 Tables are set in Meisel’s apartment to celebrate the Shabbat holiday. Students leaders say Shemtov has continued to intervene, instead of allowing them to operate independently. Eytan Abergel, vice president of Chabad Colonials, said the strain between two rabbis has become a struggle between a student group and a rabbi. Shemtov has appeared on campus and harassed students in public locations like Kogan Plaza, he said. Abergel said Shemtov had the group’s Facebook page – which served as the main form of communication between members – removed, telling Facebook that it was in violation of copyright laws. Shemtov’s attempt to copyright “Chabad GW” was denied by the federal copyright office, and Facebook reinstated the page. Sophia Brener, president of Chabad Colonials, said Shemtov has condemned students’ loyalty to her group, saying God would judge them. Both Brener and Abergel said Shemtov has been hosting events parallel to theirs under the name Chabad GW. The student group held their annual freshmen cruise Sept. 7, and Shemtov organized an event with the same title Sept. 21. Shemtov also sent a then-law student and an alumna to at least two of the group’s events: Brener said one person attended a challah bake the organization hosted last semester and another stood outside her apartment when she hosted a Passover Seder. The Hatchet confirmed these actions through court documents that included affidavits that both individuals signed and submitted to the D.C. Superior Court. The D.C. Superior Court held a status hearing last Friday. The rabbis and their lawyers met in the courthouse to schedule a hearing. Dana Foster, the Steiners’ lawyer, said the judge did not make any decisions or findings related to whether Steiner violated the court injunction banning him from leading Chabad events. Foster said Steiner and the lawyers are still appealing the Steiners’ injunction itself. Shemtov said he has overseen Chabad GW since the early 1990s and objects to the new organization using the name Chabad, because they are not involved with his organization. His organization, the American Friends of Lubavitch (Chabad), would like to engage with other Jewish organizations, which has been impossible at GW, he said. “We would even be willing to help them if they wish, since they say they have no rabbi operating at present,” Shemtov said. He added that he sent people to public Chabad Colonials events, and only to observe whether or not the Steiners were violating the injunction. Alexander Rogosa, a law student, submitted a testimony to the court in July after he observed a Chabad Colonial event that spring that the Steiners attended along with GW students. He wrote in his testimony that Yudi Steiner brought a shopping cart filled with supplies like food, plates and prayer books to the event at a student’s apartment. “While they were waiting, I heard them discuss whether they brought everything needed for the Seder,” Ragosa wrote in the document. Taylor Sears, who states she is an alumna in court documents, attended a challah bake with Chabad Colonials on Jan. 27, about a week after the preliminary injunction. She wrote in her testimony that she received a confirmation email from “rabbi@jewishcolonials.com” when she registered for the event online. That email is listed as contact information for Yudi Steiner on a website for Jewish Colonials, which Brener said the Steiners use to organize off-campus events. The “Contact Us” page listed Yudi and Rivky Steiner as the Jewish Colonials’ director and program director, respectively. Sears included in the testimony that the Steiners advertised for the challah on social media leading up to the event. On Jan. 17, two days before the injunction was in effect, Yudi Steiner posted a photo of 450 pounds of flour used for the bake in a trunk of the vehicle. Brener denied that the Steiners ran the event and said they were there as participants. 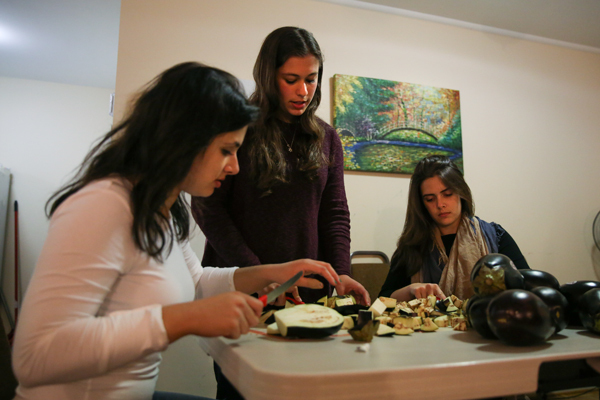 Earlier this month, the student group hosted a Shabbat dinner with about 50 students and members of the Chabad community in one of the student leaders’ apartments. Yudi and Rivky Steiner, along with their five children, participated in the Shabbat service and dinner. Jamie Weiss, a senior who has been involved with Chabad Colonials since her freshman year, said Chabad is not the same now that Steiner is not allowed to lead events. She said it’s difficult to hold events without a rabbi to give spiritual guidance. Weiss said she respects Shemtov as a rabbi, but she said that it’s “creepy” that he comes to Hillel and Chabad events at GW to recruit students. Shemtov accused her group of stealing the name “Chabad GW” from him, and he told her “God does not forgive people who steal,” she said. Carly Meisel, a sophomore who is on the executive board of the student organization, said the group members starting calling the organization Chabad Colonials “to avoid unnecessary conflict” with Shemtov, not because they thought they weren’t allowed to use the name. Shemtov’s behavior does not reflect Judaism’s ideals, Meisel said. The Hatchet incorrectly reported that the court placed a permanent injunction on the Steiners. It was a preliminary injunction. We regret this error.